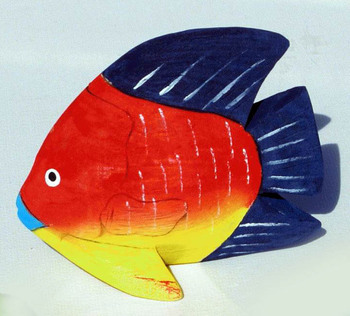 Wood hand carved small balsa fish figurine, size 10 cm. We sell a wide variety of handmade Ecuadorian crafts, jewelry and other products. We are also selling handmade ethnic products from other countries. Payment options: bank transfer, western union, moneygram, paypal. Other payment option is possible upon agreement. Shipping worldwide: by certified post, EMS, FEDEX or other shipping service, by agreement. General information: Given photos are showing samples of products, the actual variety of models is much bigger. Contact us for different models of handmade jewelry available for sale. For most of the products we dont have any minimal amount for purchase, we are very happy to see you within our customers if you buy just one or few pieces with our online shops, but we also sell in bulk and if you buy more products, you get visible discount in prices. Also price of shipping for bigger number of pieces usually is cheaper per each kg of weight. We provide discount on gross order you make with us, so you may order a small amounts of different products and you still get the best prices.